VHS tape is used and in shrink wrap. 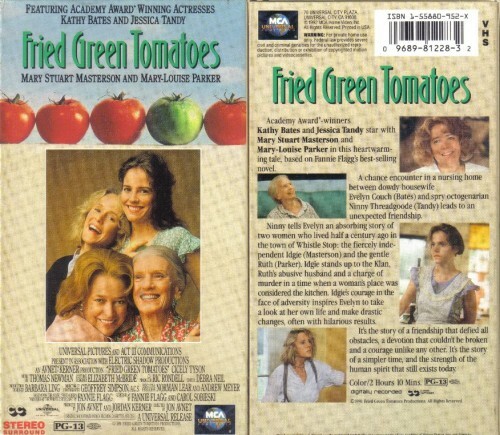 Kathy Bates stars as an unhappy wife trying to get her husband's attention in this amusing and moving 1991 screen adaptation of Fannie Flagg's novel Fried Green Tomatoes at the Whistle Stop Cafe. After befriending a lonely old woman (Jessica Tandy), Bates hears the story of a lifelong friendship between two other women (Mary Stuart Masterson and Mary-Louise Parker, seen in flashback) who once ran a cafe in town against many personal odds. The tale inspires Bates to take further command over her life, and there director Jon Avnet (Up Close and Personal), in his first feature, has fun with the film. Bates develops a real attitude toward her thickheaded spouse at home and some uppity girls in a parking lot, but dignity is generally the key to Avnet's approach with the story's crucial relationships. Tandy is a joy and clearly loves the element of mystery attached to her character, and Masterson and Parker are excellent in the historical sequences.